If you feed your flock a balanced commercial chicken feed, it's unlikely your birds will ever suffer from rickets. However, if certain toxins get into your feed and are consumed by your chickens, it could result in an inability to absorb vital nutrients. To avoid rickets, chickens needs adequate amounts of calcium, phosphorous and vitamin D3. Rickets develops because of inadequate bone mineralization, due to calcium, phosphorous and vitamin D3 deficiency. However, all of the minerals must be in the correct ratio, so excess amounts can also cause rickets. The proper calcium-to-phosphorous ratio for healthy bone mineralization is 2 to 1. Vitamin D3's role is regulating the body's metabolism and absorption of calcium. If any of these crucial minerals are out of whack, rickets can result. Rickets is not contagious, so it's quite possible that some birds in your flock suffer from it while others don't. Chicks suffering from rickets develop an obvious lameness because of the mineral deficiency. It generally appears when the chicks are about 2 weeks old. In older birds, a similar condition is known as osteomalacia. Because the bones are so soft, the bird develops bowed legs. In a worst-case scenario, chicks can't walk and can't get to food and water. Some die of suffocation because their bones aren't strong enough for them to breathe. If your chick's beak is very soft and easily moved, suspect rickets. If chicks or birds in your flock have rickets, give them three times the recommended dose of vitamin D3 in their water for two weeks, according to Hobby Farms. It must be vitamin D3 -- chickens can't process other forms of the vitamin. Also provide them with oyster shell or limestone for free-choice feeding. These items are available at farm supply stores. 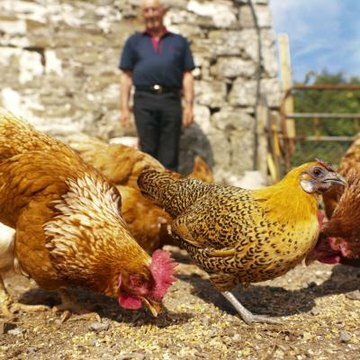 If you are mixing your own feed rations, stop that practice and feed your flock a commercial poultry feed suitable for your birds' stage of growth, such as grower or layer. Avoid excessive feeding of corn or scratch grains, which don't have the mineral content of commercial chicken feeds. Sunlight is a natural source of vitamin D3. If your flock is penned up in a dark coop with little or no access to sunlight, this can exacerbate any bone mineralization issues. Build an outdoor pen for your birds, keeping them safe from predators, or allow them to free-range outside under supervision for a few hours each day.